In high intensity shooting environments, you need to have the best tactical control over your rifle. IMI Defense has the right foregrip just for this purpose. The IMI Defense AR15/M16 Tactical Ergonomic Support Foregrip is an updated version of IMI Defense’s previously successful tactical foregrip. 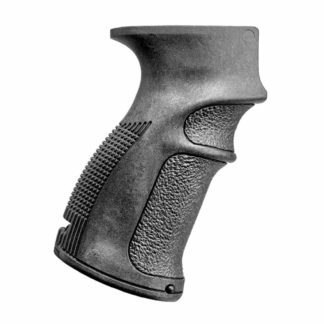 The IMI Defense Front Support Grip 2 enhances the shooter’s control over the rifle through an advanced rubberized grip with a tactical ergonomic shape. The ergonomic shape also provides for a more natural firing position. The ergonomic foregrip is sturdy enough for combat environments but light enough to reduce muscle fatigue and increase the speed of target acquisition. It even manages to slightly reduce recoil. Beyond the IMI Defense Front Support Grip 2’s obvious tactical advantages, it additionally can be attached to your AR15’s magazine well, sitting right where you want it while moving around. IMI Defense develops and manufactures the highest-quality, most ergonomic and innovative tactical weapons accessories, components and parts in the world to meet the rigors of combat performance. All IMI Defense products are perfected through rigorous testing with Israel Defense Forces Special Operations units and other branches of the Israeli defense community – and used by elite IDF forces and military and policy experts throughout the world. It needs to slide in from the front.